HUNTINGDON Fusion Techniques, represented by Perfect Welding , has updated the design of its TEG-2 and TEG-3 tungsten electrode grinding machines by changing the grinding head from the three o'clock to the six o'clock position. Key advantages of this change are that dust is no longer expelled upwards towards the operators face while grinding and the operator can now see more clearly how the grinding is progressing. The TEG-3, continues to be manufactured in the UK to European CE regulations and conforms to all required standards. It has been designed especially for the grinding of tips on tungsten electrodes as used in TIG and plasma welding. This useful tool will axially grind all diameters of tungsten welding electrode from 1.0 to 6.4 mm and lengths down to 15 mm with the aid of the special collet accessory. A long life, relatively low cost diamond wheel that gives the equivalent of three man-years of grinding life is fitted. The wheel is protected by a front cover that prevents the grinding of other materials, thus eliminating the risk of contaminating electrodes and obviating the transfer of undesirable elements to the weld pool. 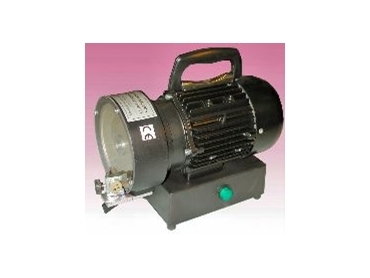 A low cost vacuum unit to extract grinding dust is available for bolting onto the side of the grinder as an accessory. A powerful high-speed motor provides the correct speed for diamond grinding of tungsten and is available for use on either 110 volt or 220 volt 50/60 Hz, single-phase connection.